A unique exchange agreement has been launched for Le Cordon Bleu Australia students studying either the International Hotel or Restaurant Management Degrees and Le Cordon Bleu Madrid at Universidad Francisco De Vitoria, studying the Bachelor Degree in Gastronomy. Le Cordon Bleu Australia students may now access a unique exchange agreement with Le Cordon Bleu Madrid. This program allows for students between the two campuses to live and study in the partner location for 12 months. 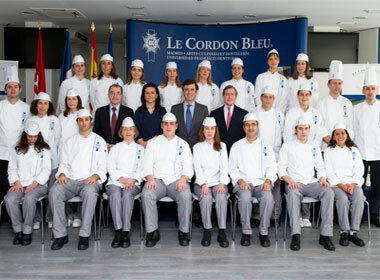 For Le Cordon Bleu Australia students it will be to complete the third year of their degree in Madrid, while for Le Cordon Bleu Madrid students they will be able to complete one year of study representing the second semester of their third year and the first semester of their fourth year, which they would complete with our Australian partner, the University of South Australia. Travel and accommodation is self-funded, but the fees paid for the course in either Le Cordon Bleu Australia or Le Cordon Bleu Madrid, will be carried over to the study in the partner location, so will be at no further cost to the student. For students who have the passion for travel and the desire to experience life in a European or Australian destination this is a rare opportunity. Le Cordon Bleu Madrid is at the heart of a world-renowned tourist location with a diverse gastronomy that has always known how to combine innovation with tradition. Madrid as the great international capital of culture and entertainment, is a place full of interesting opportunities for those aspiring professionals in culinary arts, hospitality and management. The programs are taught in English in both locations, however, it would be an advantage for Le Cordon Bleu Australia students planning to study for a year in Madrid to be able to speak a little Spanish to enjoy the full experience of living and studying in Madrid.